Phoenix with Mesh and without Mesh ? what it is about ? I am surprised about this change, it is because I have hear before that Phoneix with Mesh, it was a rumour and I thought that they would leave, forget or even stop the development of it to continue with FireStorm Viewer (which is their own version of Sl Viewer 2.2 or 3 with mesh support). What I understand now is that Phoenix Viewer will be extended a little bit more but after they will drop completely. 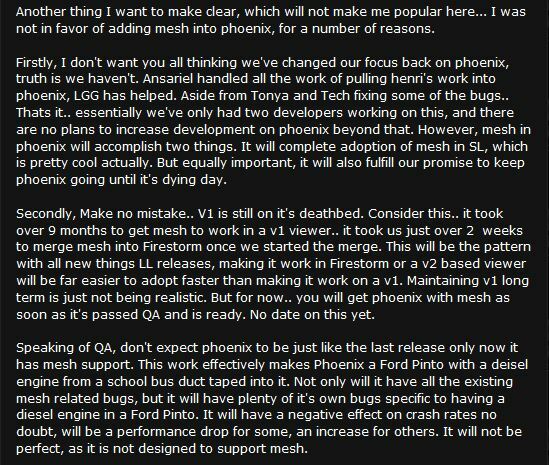 This is just an advice for those who are waiting the next version of Phoenix with Mesh support and what this means, it will not run an old hardware if it doesn’t have support for SSE2, any way there will be another last version of Phoenix without Mesh support. I don’t mean that those who run an old hardware have to buy a new computer (many residents can’t afford that and I can understand), they are just giving an advice that this version of phoenix will require a faster computer with SSE2 capable computer. With this statement, it is clear that the support to Phoenix is comming to finish one of this days but it doesn’t mean this is the end, why ? well because as the code of phoenix is open source, then who knows ? may be someone would like to continue developing!. This entry was posted in Old Post on October 26, 2011 by Xpontaneus.